One of the most difficult records to get a hold of is the Indecision - Release the Cure - Sea Foam Green, on the French label Overcome Records. I really have no idea how many of these they made, but I'm sure it's less than 250. It's looks a lot different than the mint green version release by MIA. 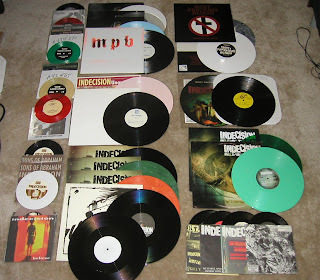 As I mentioned a few months back I've managed to gather up a few more records for my Indecision/MPB collection. Still a ways to go. But I put it together again and snapped a pic.